Publishing their latest newsletter to investors, Pantera Capital has stated that “Venture capital will drive bitcoin growth”. The essay is part of their overall research which covers recent developments in bitcoins over the past month as well as technical and fundamental analysis. Last month’s research was notable for presenting further bullish forecasts for bitcoins despite a month long rally having already taken place. This time around, Pantera is focusing on the emergence of venture funds into the sector. The timing of the report couldn’t be more opportune as it was distributed just as Xapo had made public that it secured $20 million in new funding. Pantera Capital themselves has also been responsible for a portion of the growth in investing, having led a $600,000 seed round in BitPagos. 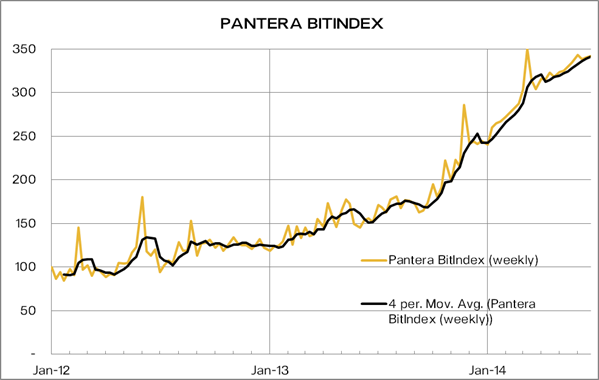 According to Pantera’s estimates over $250 million in funding has been reported for 2014, compared to $88 million in 2013 and $9 million in 2012, adding that the investments have gone to “funding a minimum of 3,592 Bitcoin projects around the world, almost three times one year ago”. We believe the TCP/IP analogue is great. If you saw that protocol’s promise you had no direct investment opportunity. You couldn’t buy a chunk of TCP/IP. Investors could only buy proxies – like Pets.com. Bitcoin may be unique in offering investors a direct stake in the protocol. Bitcoin investors own a piece of what may be the future payment rail – not just memories of Sock Puppet. The data points for that index are just silly. While many of those things may influence price, you can’t pretend you can actually measure and value them properly, nor their interactions. Seriously flawed.